In May of 1892 the United Association chartered Local 68. Our young Local Union had seven charter members: Ed Burnback, L. F. Delesdenier, H. Hessler, J. McNeely, B. E. Smith, J. H. Smith and Louis Tipps. They were dedicated to the principles of unionism. The Local held meetings every week and elected Union officers every year. It soon attracted other journeyman plumbers who joined the Union. In 1924 Local 68 had grown to 125 members and by 1929 to 218 members. Apprenticeship programs were established in the 1920’s. However, in those days apprentices were not allowed to become members until they completed their apprenticeship. This practice didn’t change until the 1940’s when the first apprentices were initiated as members. During the 1930’s Local 68’s members remained united. They had annual picnics and the Ladies Auxiliary Club worked hard to provide for the families of unemployed members during the great depression. In 1938 Local 68 merged with Local 195 of Beaumont, which became the Industrial Pipe Fitters branch of Local 68. By 1942 the membership had grown to 785 and would not reach this level again until 1965. The decline began in 1943 partly due to in-house fighting between plumbers and pipe fitters. As a result the pipe fitters pulled out of Local 68 in 1943 when the United Association chartered Local 214, which later became Local 195 of Beaumont and Local 211 of Houston. During these turbulent years Local 68 held Union meetings twice a month and elected officers every two years. During the 1950’s Local 68 was progressive and established a Health and Welfare Plan on December 23, 1955. In 1956 the officers negotiated a journeyman wage scale of $3.171⁄2 per hour, insurance contribution of $.071/2 per hour and established an Apprentice Training Fund at $.01 per hour. During the 1960’s Local 68 doubled in membership, adopted a Residential Branch and worked hundreds of members on apartments and housing. In 1964 the Local established a Pension Plan with a contribution rate of $.10 hour. Local 68’s annual Christmas Party for members’ children began in the 1960’s and remains one of the most popular events held today. 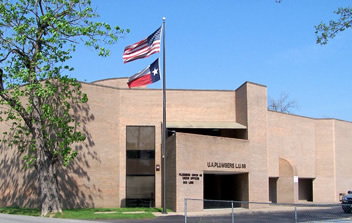 In 1968 Local 68 purchased the property at 468 Link Road in Houston and built the first Union Hall owned by the members. Today it serves as the Fringe Benefit Offices. In 1975 Local 68’s membership grew to almost 1500 with the merger of Local 567’s plumbers from the Bryan-College Station area. Additionally, Local 68 opened the new Union hall and offices at 502 Link Road. In 1979 the Galveston area plumbers of Local 200 were merged into Local 68. That same year our health insurance became self funded and administered to save money and provide personal service to the members. During the late 1970’s and early 1980’s Local 68 began an active organizing program and the membership grew to almost 1800. By 1984 tough times hit Local 68 and two-thirds of the 1794 members were unemployed. The Local was forced to take a wage reduction and the membership declined to less than 1000 by 1987. During the early 1990’s the economy showed signs of improvement and so did Local 68’s work outlook. By the mid to late 90’s the membership again began to increase along with our wages. The earlier sacrifices made by the membership were paying off as our contractors were obtaining more work in all sectors of construction including commercial, hospitals and even schools. Local 68 continued to provide an excellent Christmas party for the membership and their children and started the Local’s 1st annual Saltwater Fishing Tournament in 1998. As Local 68 moved into the new millennium we were back to full employment and membership increased to over 1000. Our apprenticeship program was training over 600 students each semester and emphasis was focused towards the computerized future. A vision of a new Union hall in Beaumont to serve our members in East Texas became a reality in late 2003. Additionally, property was purchased in Houston for future expansion of our Training Center. Today as we evaluate where our Local Union is and where we expect to be in the future, our outlook appears bright. We currently maintain a membership of over 1800 spreading across 62 counties in Texas. Those counties are Angelina, Aransas, Austin, Bee, Brazoria, Brazos, Brooks, Burleson, Calhoun, Cameron, Chambers, Colorado, Duval, Fayette, Fort Bend, Galveston, Goliad, Grimes, Hardin, Harris, Hildago, Houston, Jackson, Jasper, Jefferson, Jim Hogg, Jim Wells, Kenedy, Kelbert, La Salle, Lavaca, Lee, Leon, Liberty, Live Oak, Madison, Madison, Maatagorda, McMullen, Milam, Montgomery, Nacogdoches, Newton, Nueces, Orange, Polk, Refugio, Robertson, Sabine, San Augustine, San Jacinto, San Patricio, Shelby, Starr, Trinity, Tyler, Victoria, Walker, Waller, Washington, Wharton, Willacy and Zapata. We remain dedicated to education with our recent $3.5M Training Center expansion to accommodate our 600 apprentices. Our apprentice’s training hours now may be applied towards college credit hours. Several Journeyman courses being offered at our Training Center may also be applied to college credits for various degrees. Since 2002, our scholarship program has provided over 686 scholarships to our members and their families. As we are in our 124th year of existence, Local 68’s leadership continues being dedicated to what got us here – apprentice training, serving our members, the community and protecting the health of the nation.